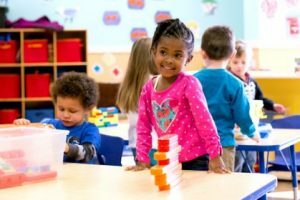 Children’s World Learning Center brings a new and refreshing outlook on child care in the Greenville NC area. Our program has been carefully crafted to ensure that children of all ages receive an excellent education and are provided with high-quality child care. Keep reading to learn about the Children’s World difference and how we can make a difference in the life of your little one! An unrelenting commitment to educating young children. Providing continuity from birth to fifth grade. Competent teachers invested in professional development. Building minds through a creative and engaging curriculum. A comprehensive set of services: childcare, academy, therapy, after-school, and creative arts. Facilities and playgrounds providing a safe and engaging learning environment. Convenient pick-up of infant and school-age children at the same location. Learn more about Children’s World Learning Center and all of our offerings for you and your family.